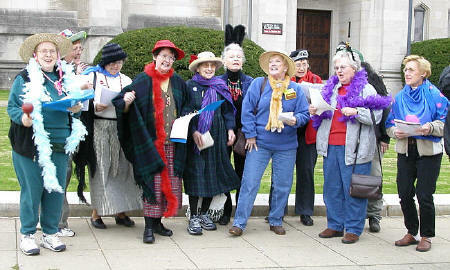 In the tradition of wise women elders, the mission of the Pittsburgh Raging Grannies is to promote global peace, justice, and social and economic equality by raising public awareness through the medium of song and humor. Our goal is to challenge our audiences to work to bring about the social changes that are required in order to end economic oppression, particularly of women and children, and to end racial inequality, environmental destruction, human rights violations, and arms proliferation. We model ourselves after the Canadian Raging Grannies. We use tunes of old songs and write lyrics to fit what we sing about. We are challenged to keep step with current issues.